Both Dash and Bella are out of the house today after 10 LONG DAYS at home. The quiet is bliss. Sort of like the silence after it snows. I'm sipping coffee and trying to shake the foggy feeling from my head. I've fallen behind. Posting one recipe a day for my new year's recipe countdown is proving to be impossible. I"m going to try to catch up. 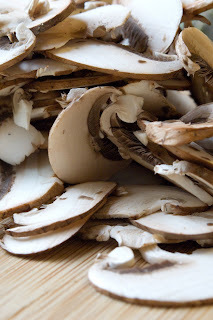 You will need a surprising amount of dressing because mushrooms are like sponges. I used cremini (or crimini) mushrooms. I just learned that they are baby portobellos. They're also called baby bellas. MY baby Bella turns her nose up at mushrooms. What is it with kids and mushrooms? 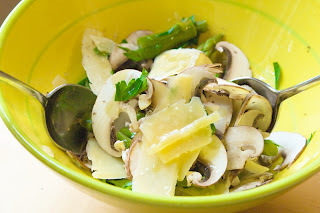 Cremini and asparagus salad? Yes, I know. You can't grow asparagus in California right now. They just looked so beautiful and spring-like. They were conventionally grown and from Chile. And to tell the truth they didn't have much flavor. Bad, bad carbon footprint asparagus. Tomorrow I"m going back to organic local kale, squash, onions, leeks, and Brussels sprouts. If you do make the salad, you can replace the asparagus with green beans or fennel or just keep it a simple mushroom salad. And in the spring, make this salad with beautiful young and skinny asparagus from the farmers' market and it will rock. I finish off the salad with thin slices of aged gouda. The caramelized taste and the flavor crystals (that's what I call them but they're actually crystallized lactic acid) make the cheese like candy. Bella looks at me like I'm either stupid or crazy when I say that aged gouda tastes like candy. You can replace 1/2 the olive oil with walnut oil or hazelnut oil. Green beans are a good replacement for the asparagus. Thinly sliced fennel would also work well. Or just make it a solo mushroom salad. In a bowl, squeeze half 1/2 the lemon over the chopped shallot and let sit for a few minutes. Whisk in parsley, mustard, salt, and pepper. Slowly whisk in olive oil. Taste and add more of any of the lemon or dressing ingredients if it's not balanced. In another bowl, combine mushrooms and asparagus (or alternate vegetable). Drizzle over 1/2 the dressing and quickly combine with a fork or your fingers. Add more dressing in a minute or so. 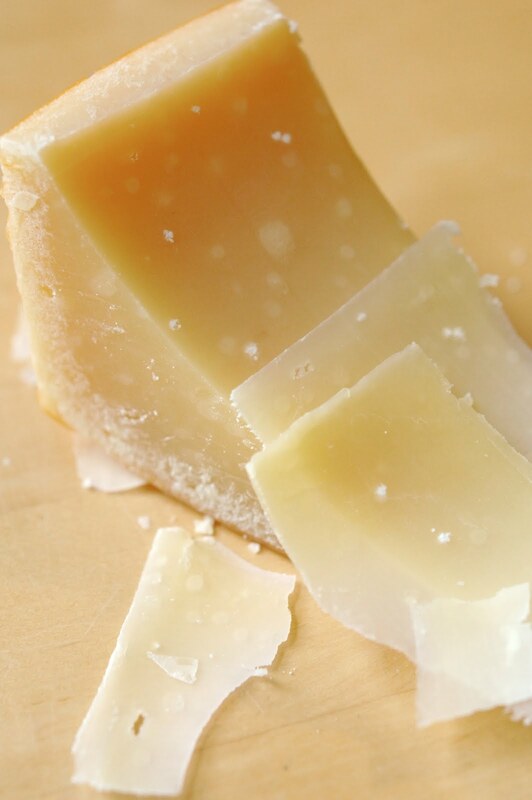 Shave lots of thin strips of aged gouda over the top of the salad with a vegetable peeler. Drizzle over a bit more olive oil and cunchy salt. Eat immediately. 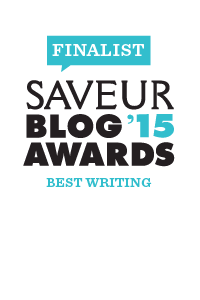 I just discovered your blog and love it. In fact, I just posted a link back to you. Your cremini salad adds a nice new touch to one I already love. We will have to give this a try. I also love the persimmon recipe. I never knew what to do with the ones my Nana gave me. So glad I ran across you. I will certainly enjoy exploring your recipe archives. Bookmarked! Ha. I call them crunchies!